(KIA) - 4 January 1944 Mission #95 to Kiel, Germany in B-17 #42-31526 Sweet Anna 427th BS (GN-V). Gave a distress signal after it was hit by enemy fighters and left the formation. Sweet Anna was on her first combat mission. Ditched in the North Sea. 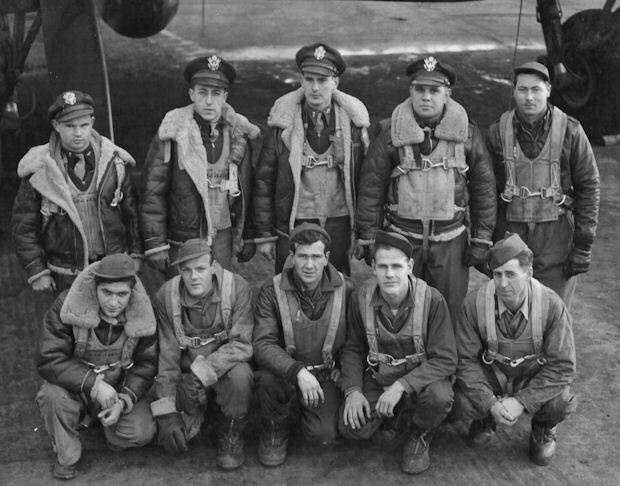 All ten crewmen Killed in Action. Regular Humphreys Crewmen were on their 15th combat mission. Navigator - Lt John J. Culpin, Jr. replaced by 2Lt Harry Hladun (KIA) who on his first combat mission. Lt Culpin completed his combat tour on 16 March 1944. Bombardiers - Lt George T. Orvis, Jr. replaced by 2Lt Burnie N. Mire (KIA) on his fifth combat mission. Lt Orvis completed his combat tour on 20 April 1945 as a Lead Crew Bombardier. Right Waist Gunner - S/Sgt Russell H. Beach flew 13 combat missions and was removed from combat status for an unknown reason. Was replaced by S/Sgt Melvin M. Dare on missions #89 and 92 and S/Sgt Edward P. Madak (KIA) on mission #95. S/Sgt Madak was on his tenth combat mission and had flown with five different Pilots. His body was recovered on 4 October 1944 on Ameland Island, Holland. Tail Gunner - S/Sgt Austin J. O'Neil flew four combat missions with the Humphreys Crew. He later flew an additional 27 missions completing his combat tour on 19 July 1944 (Mission #207) Was replaced by S/Sgt William C. Sparks (KIA) who flew thirteen combat missions - eleven with the Humphreys Crew.